How does ironing remove wrinkles from clothes? 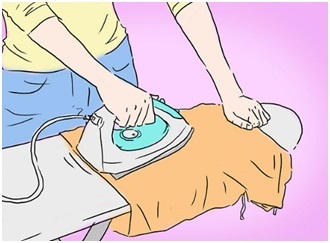 In this article you will get to know that how does the ironing remove wrinkles from the clothes. Q. How does ironing remove wrinkles from clothes? Ans. Iron uses a combination of heat and pressure to remove wrinkles from the fabrics. First, while ironing the clothes, heat of the iron loosens the bonds between the long chain polymer molecules in the fibers of the fabric. After that, while these molecules are hot, the pressure applied by the iron straightens up the fibers which hold their reformed shape as they cool down. Previous Article Why do we blink our eyes? Next Article Why does sea-water appears blue?